Ready-to-install UNIGATE IC bus nodes from Deutschmann Automation relieve automation manufacturers from having to develop interfaces and thereby help them offer products for various protocols with little one-time development effort. The all-in-one bus nodes in a 32 DIL housing have been designed for embedded solutions for direct integration into terminal devices. The modules comprise a microcontroller, flash, RAM, and a bus controller. They handle the complete communication on the bus side, thus reducing the workload of the application&apos;s microprocessor. 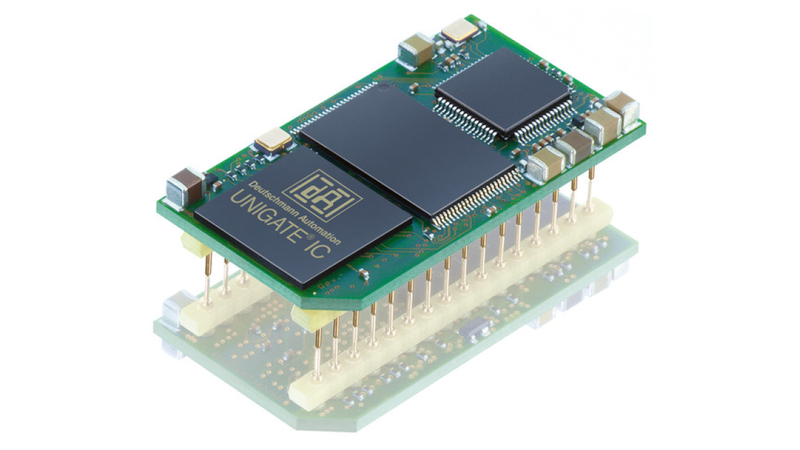 UNIGATE ICs are connected to the host processor via a UART interface. Amongst others, Deutschmann offer models for Profibus, DeviceNet, CANopen, Modbus TCP, PROFINET, EtherCAT, EtherNet/IP, Ethernet TCP/IP, LonWorks, and BACnet. Furthermore, models with an RS232 or RS485 interface are available for Modbus RTU and Modbus ASCII. Thanks to the identical hardware and software interfaces and functionality of all UNIGATE IC devices, manufacturers can offer various protocol options to their customers. They only need to integrate an adaptation board with a socket for the bus modules or implement a socket directly on the device PCB. Then they can insert the UNIGATE IC model for any customer&apos;s choice communication protocol.